Unlock Your Body's Natural Ability to Sleep Soundly, Boost Energy and Lose Weight! When it comes to health, there is one criminally overlooked element: sleep. Good sleep helps you shed fat for good, stave off disease, stay productive and improve virtually every function of your mind and body. When a degenerative bone disease crushed Shawn Stevenson's dream of becoming a professional athlete and restricted his ability to function normally in daily life, Shawn took his health into his own hands. Through better sleep and optimized nutrition, he not only healed his body but also achieved fitness and business goals he never thought possible. 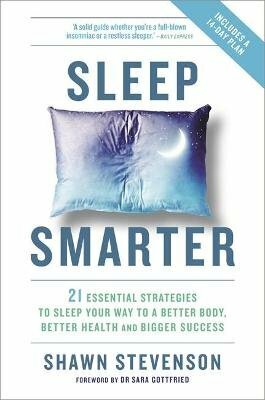 Now in Sleep Smarter, Shawn shares easy tips and tricks to discover the best sleep and best health of your life. With a 14-Day Sleep Makeover, you'll learn: - How to create the ideal sleep sanctuary - How to hack sunlight to regulate your circadian rhythms - Which clinically proven sleep nutrients and supplements you need and why - Stress-reduction exercises and fitness tips to keep you mentally and physically sharp... and more! Sleep Smarter is the much-needed guide for achieving the rest, energy and life you truly deserve.